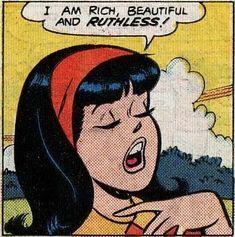 Veronica Lodge is a love of interest of Archie the main character from Archie comics. She has appeared in TV, comics, radio shows and comics since her first appearance in the 1940s. Veronica is played by actress Camila Mendes in the C.W. TV series Riverdale. Veronica appears a few months into the Archie comic series and is the new girl in Riverdale High School. She is the only child of the wealthy Hiram Lodge. Hiram wanted his Veronica to grow up and live a normal childhood without being spoiled and so he moved the family to the small town of Riverdale. Despite her father attempts to curb her materialism Veronica is often vain and conceited. She is prone to go on massive shopping sprees and is always wearing the latest fashions. Her father on occasion throws a monkey wrench at her by taking away credit cards, banning her from seeing Archie or forcing her to get a job. Despite her sometimes snobbish attitudes Veronica never hesitates to hang out with her middle class friends. Veronica's closet friend and most bitter rival is Betty. Both girls have an off and on again love interest with Archie Andrews. The competition between the girls expands beyond Archie to any accomplishment. Veronica feels that she must constantly one up Betty. Other love interests for Veronica include Reggie. Reggie is more well heeled than Archie and is thus approved of by her father. However, Reggie is often dropped by Veronica because she sees Betty dating Archie. Jughead and Veronica can not stand each other and constantly argue. They manage to keep things semi-underwraps so they can both be around Archie. Veronica has no siblings but does have cousins Leroy and Marcy who sometimes come to visit. Leroy is often willing to break the law and often conflicts with Archie. Marcy is a "geeky" girl into science fiction but is kind to Veronica and often helps get her out of problems. Riverdale is a show based off of Archie Comics but has a darker tone. Veronica Lodge is a main character in the series and is played by actor Camila Mendes. Veronica moves into Riverdale with her mother after her father was caught embezzling massive amounts of money. Betty and Veronica become friends and Betty introduces Veronica the song writer Archie. 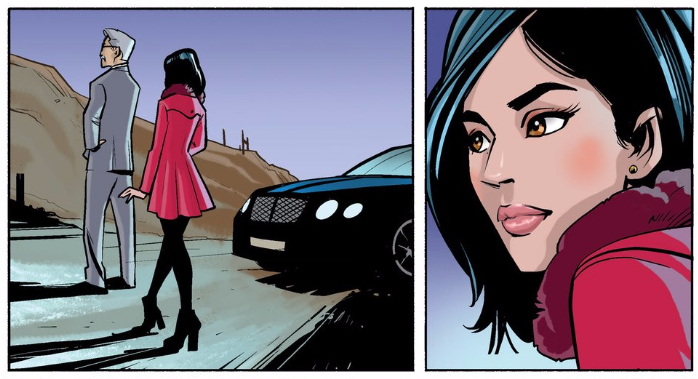 Veronica can see that Betty is hopelessly in love with Archie and urges her to ask to him to the dance. Betty gets shy in the last moment and asks Archie to accompany both girls as a group date. Archie is initially hesitant but finally agrees to go. Archie greatly hurts Betty's feelings by dismissing her emotions for him. At a party at Cheryl Blossom's house Cheryl dramatically arranges for Veronica and Archie to have 7 minutes in heaven together. Initially, the two awkwardly talk but do end up kissing each other. Feeling betrayed by her new friend Betty storms out of the party. At the high school pep rally Cheryl Blossom is overcome with grief and flees from the stage. Betty chases after her but finds that Veronica is already their consoling her. Veronica attempts to make up with Betty by buying her flowers and cupcakes. In the end Betty decides to try to be friend again. The two decide to go to Pops and get ice cream sodas. They run into Jughead and Archie at Pops where the four all sit together and enjoy a meal.